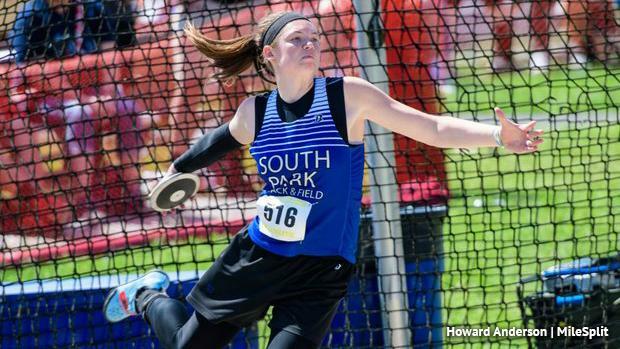 A trio of girls enter the 2019 outdoor season with best throws in the discus over 140 feet. Leading the way in terms of best throw is Mallory Kauffman. The Greenwood senior was third in AA last season, just an inch off second place. Her best throw a year ago was 146-10, which came to win to District 3 title. Kauffman saw a nice improvement in the shot put this indoor season, so she'll look to do the same in the discus. But standing in her way in the defending AA state champion, Maura Huwalt of South Park. She threw 139-1 to capture the state title a year ago. Now a senior she'll look to add her second state gold to her collection. Her best throw last season was 145-1 from the Penn Relays. In AAA, Mackenna Orie of Hempfield Area is the lone 140+ girl back from last year; her best of 141-9 came at outdoor nationals. Orie, the indoor state champ in the shot, is also the only AAA returning state medalist. She was fourth at Ship last season and will look to add a disc state crown to her resume. A host of others will be looking to challenge Orie, or at least get on the podium this spring. Lehighton's Isabelle Meckes (ninth), Cedar Crest's Hannah Woelfling (tenth), and Lampeter Strasburg's Kristen Herr (11th) all just missed the top 8 at states last year in AAA. Woelfling threw a best of 135-5 last spring. As for AA, there are a number of other strong returners this season. Marian Catholic's Emma McClafferty was sixth at states last year and Hickory's Molly Piso took eighth. In AA. Both are back, looking for return trips to the medal stand at Ship. Lakeland's Mikayla Marino returns with a best throw of 126-4 from last year. As for the PAISAA, Meaghan Toscano of Germantown Academy will be the overwhelming favorite. The indoor All American in the shot threw 123-7 in the disc last season to win the PAISAA title.